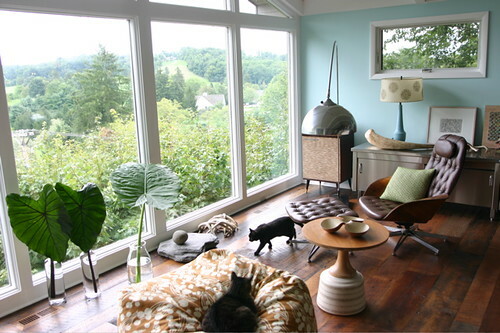 Above: Amy and David Butler’s living room featuring a Steelcase sofa and Vladimir Kagan’s Contour rocker, named by ELLE Decor as one of the 10 most riveting rockers. Amy Butler is well known as a fabric designer, but she first wrote a Chronicle home design book with her husband David Butler, called “Found Style: Vintage Ideas for Modern Living”. Their abode, which will be featured later this year in Blueprint, is a 1969 George J. Stegmiller post and beam, perched on a steep hill with amazing views. The upstairs is their home, the lower level serves as a studio. David describes their style as “kinda modern-organic-primitive”. He photographed their home for an upcoming book “Amy Butler’s Midwest Modern: A Fresh Design Spirit for the Modern Lifestyle”. A preview of some of those images are below. Top left: chair found in Springfield Ohio. Top right: sofa covered in Amy Butler’s fabric. Above: Arcadia sofas from Room and Board. Sadly no longer in production — at least not available on the website. 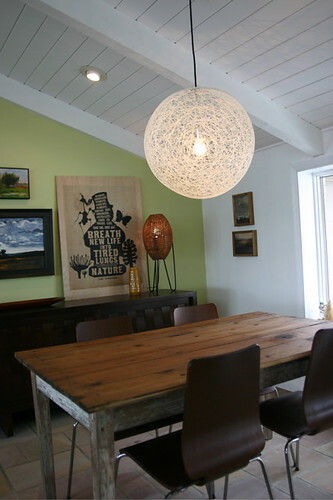 Above: Dining room with Crate and Barrel’s Jasper Sideboard. what a cool house! 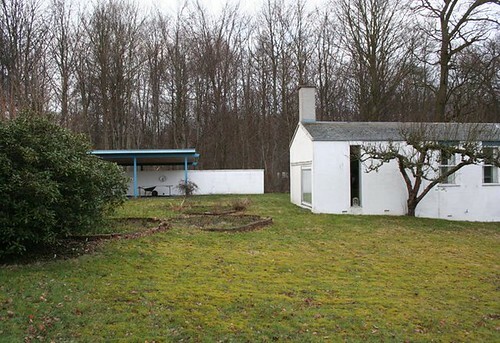 almost makes me want to move back to the midwest and score myself a mcm home to restore. Amy your house is done straight from your heart and original , i think that it is done passionately about your childhood history , all the components in your house put together very well relating to some memories .You are very courageous and thoughtful . Bravo Amy and David. You have followed your dreams and visions. Love it! So many homes I see on blogs these days are styled to within an inch of their lives. This one is very refreshing. Any idea where I can get that poster “breathe new life…” ? Found style was one of the most riveting books I found by chance and takes a place of honor among my many design books. What makes Granville, OH such a magnet for great stylists? Any chance there is a house tour of homes in the Granville area in Spring 2009? Many thanks for your fine work.